A mixed basket of pre Easter treats for March. Some more palatable than others. A couple of years ago as Playtech looked to emulate everything Evolution were doing there was talk from studio personnel that a Blackjack Party style table was on the cards. Fast forward to 2018, a new studio and Playtech introduced Disco tables in March. Though not a straight port of Evolution’s Party format tables complete with a pair of dealers slash presenters, the new disco tables obviously being aimed at like minded players. 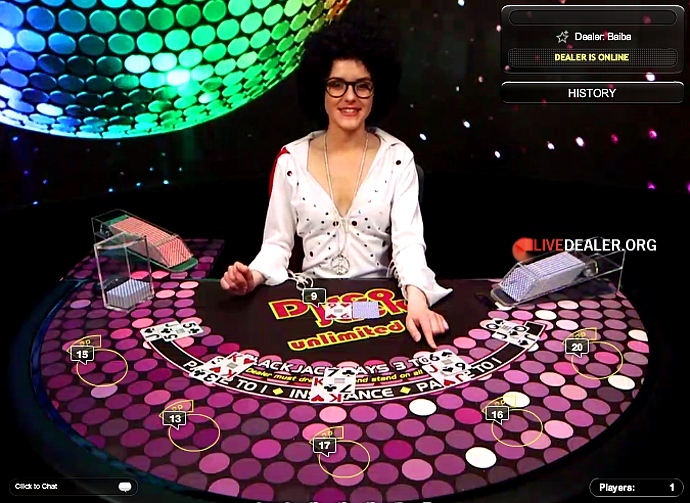 The new Disco tables (roulette and blackjack) combining costume, music and cross table dealer chat to a new level not seen previously at Playtech. It’s almost as if somebody present at the famous end of year themed parties said you know what would be a good idea, if only we could bottle it and Discojack/Discolette were born. I for one can’t wait for Discorat (no not a dancing rat), a bold and exciting mash of baccarat and disco…yeah baby! 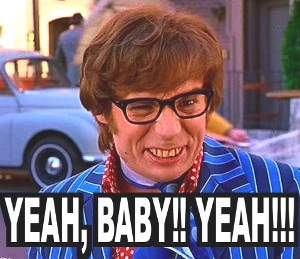 !, yeah!!!. If the new Disco tables aren’t to your liking then Playtech are presumably hoping the new Soirée Blackjack will assure players there’s no need to abandon ship. 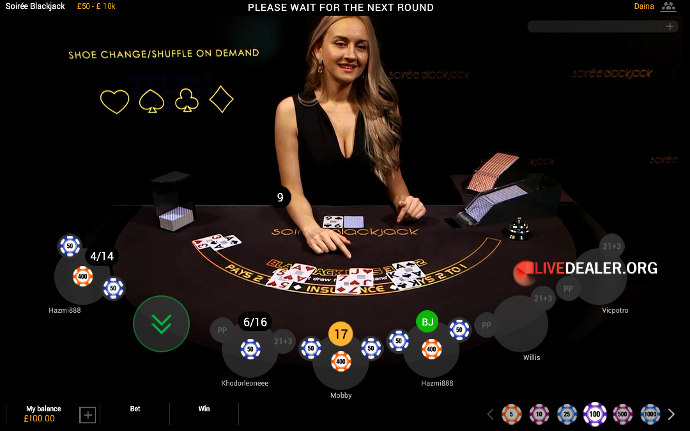 In another example of anything you can do, we can do in a fashion, Playtech’s other new blackjack table for March has features you’ll find on the Salon Privé tables at Evolution. Albeit Soirée Blackjack is for multiple players and comes with a much lower table minimum. As I discussed in February’s blog it’s not the first time options of this ilk have existed on a multi-player blackjack table at Playtech. Many Easter eggs ago similar options were available on the old dedicated bet365 table. The most disappointing aspect of the new Soiree table is background noise from out of sight tables. Again, not for the first time a VIP table at Playtech comes with this unwanted distraction. There’s really no excuse for it now with the self-proclaimed world’s largest live dealer studio. 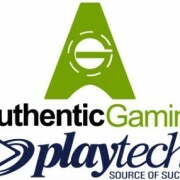 Hot on the heels of the partnership deal announced in February between Playtech and Authentic Gaming there was more to come in March. This time it was the turn of the Betsson Group grabbing the limelight with news of a global content deal with Authentic Gaming. 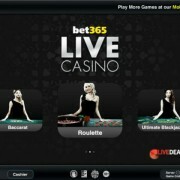 Players at Betsson brand casinos will have access to the premium table collection of in-casino live roulette streams provided by Authentic, including Foxwoods Resort Casino in North America. Quite a year for Authentic already, and strange to think that players from Playtech and Evolution casinos might shortly be playing at the same tables even though they would never be aware of each other. 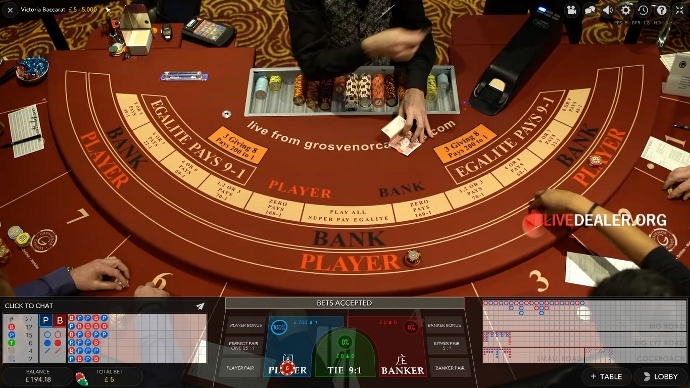 Evolution Gaming launched their first in-casino baccarat table in March. A first from Evolution, though not unexpected as regular readers of the forums would have been waiting for the new Dual Play game to go live. 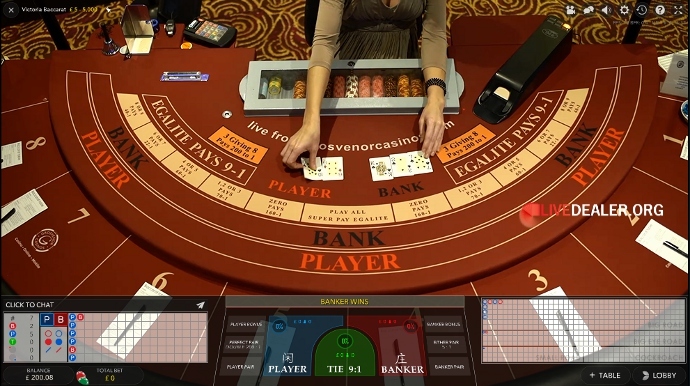 Located in the Grosvenor Victoria Casino, the table has the look and feel of Evolution’s previously opened in-casino roulette tables but that’s no bad thing. The multiple camera angles do a good job of bringing all the table action to you. With the sound turned up you can also hear what the players at the table are saying. All of which makes for a lively feel to the game when patrons are in the London casino. Naturally the game doesn’t flow so fast as studio tables (especially so the speed variety) while you wait for seated players at the table to exchange cash for chips and so on, but its definitely a table I will return to again. 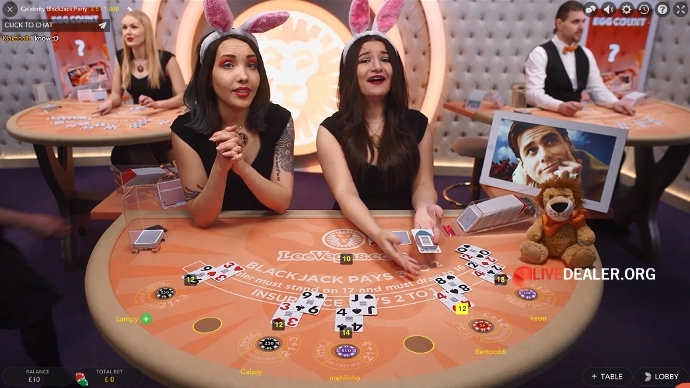 The boosted 9:1 Tie payout is an extra bonus, though that’s not new to online baccarat players at Grosvenor which is presently the only place you can play Evolution’s new Dual Play table. 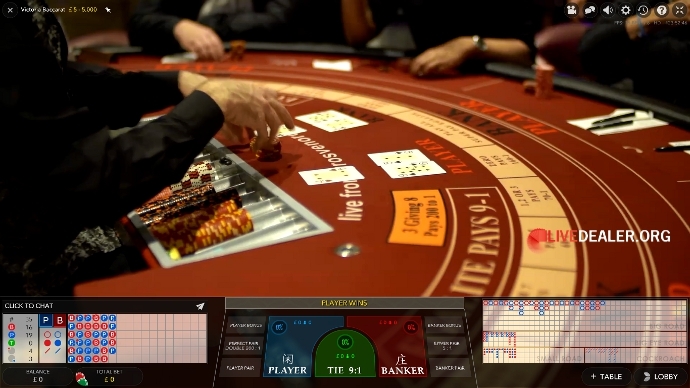 Evolution’s latest step towards baccarat nirvana was launched in March. 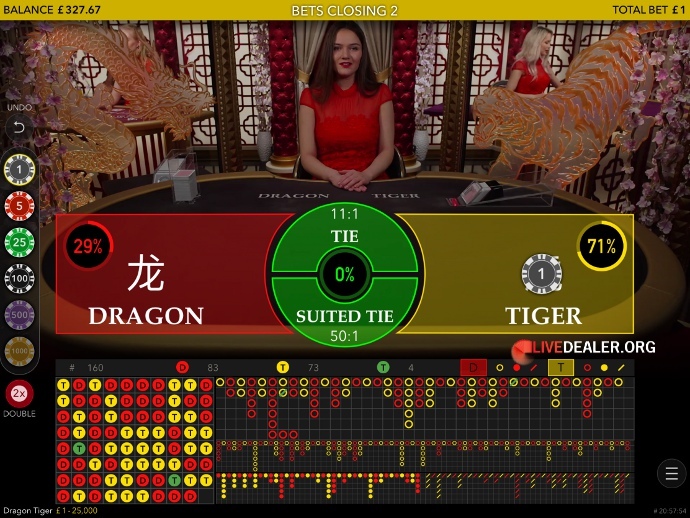 Although not trully another baccarat, the new Dragon Tiger table is likely to appeal to casual baccarat players and new players alike with its similar format, albeit simpler game rules. LD’s blog gives a good account of the new table and how to play for players unfamiliar with the game. As ever when Evolution bring a new table or game to market they also have it ready for mobile devices. The Dragon Tiger table being no exception (pictured here on iPad). It looks really nice on mobile devices and is a good game choice to play with its fewer betting options. 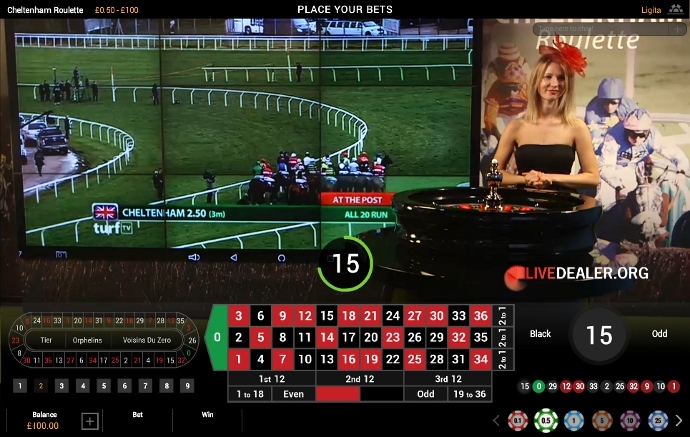 Making a welcome return at Playtech was the special Cheltenham roulette table for the duration of the horse racing festival. 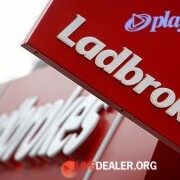 Coral and (new for this year) Ladbrokes players could watch all the four legged action live playing roulette. Somewhat to my surprise I had liked the table last year, and was pleased to see it return bigger and even better thanks to the new large video wall. The dealers were brought into the races by picking £50 bets for charity. A simple thing, but it gave them a horse to cheer on during the race. To be precise, they weren’t actually vocally cheering but there was plenty of arm gestures and it was something to talk about after the race. And yes, they apparently got free choice in selecting a horse for the upcoming race, not simply a random name out of the hat type of pick as you might have thought given that it was Playtech and its (non equine ;)) track record. Instances like this always catch my attention at Playtech as it wasn’t so long ago that its dealers weren’t even allowed to say the words “red”, “black” or “green” in any general conversation on roulette tables to avoid accusations of player misdirection, collusion or whatever. By the end of the festival the dealers had racked up around £3000 in winnings for charity. At that rate of success players might want to consider asking dealers for horse picks in future. This is definitely one part of the Ladbrokes Coral group output that GVC Holdings ought to hang onto the reins following the imminent acquisition and any consolidation of assets. Even if the live tables ultimately do end up at Evolution. Last year after many years of Easter Playboyfication of female dealers at Playtech, they invested in new see-through ears for the ladies to wear. I imagine they were supposed to look more classy, but they were pretty useless as they looked almost invisible against many backgrounds. So, back to the old studio ears then you might think then for 2018. Well no, as with the most recent Valentine, Christmas and Halloween promotional periods Playtech look to have turned their backs on past tradition at the new studio and dispensed with having table trimmings and dealer accessories across the range of general access tables. As for the 2017 see-through ears, if they didn’t already go in a rubbish skip at the old studio, maybe Playtech decided to keep them for another end of year shindig at Godvil,Riga or wherever ;). If you did want dealers plus bunny ears Leo Vegas were accommodating on the Celebrity Blackjack Party table at Evolution. 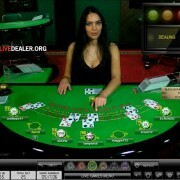 Overall though, as LD observed in the forums there was little evidence of Easter across the range the live dealer platforms. Through last year and into 2018 Evolution Gaming has continued adding to, and updating its European native language tables. 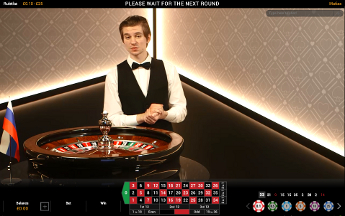 The inventory of tables housed in Evolution’s Malta studio now includes a modern looking Norsk language roulette table. 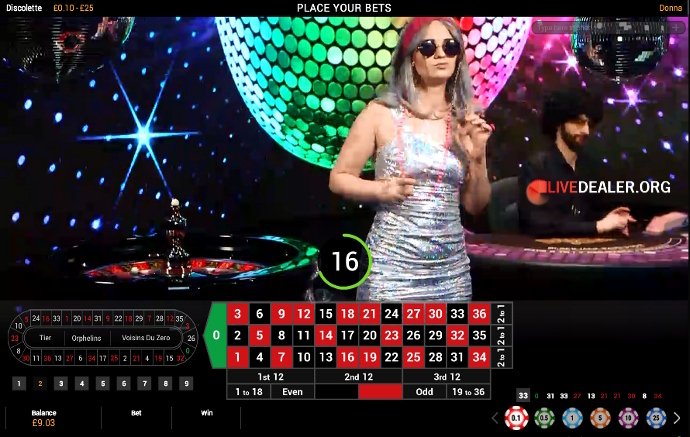 The new Norsk Roulette table is an Immersive Lite installation and looks better than most roulette tables you ever come across (including some VIP). From my perspective what’s not to like, the windows, curtains and video screens look works so well. 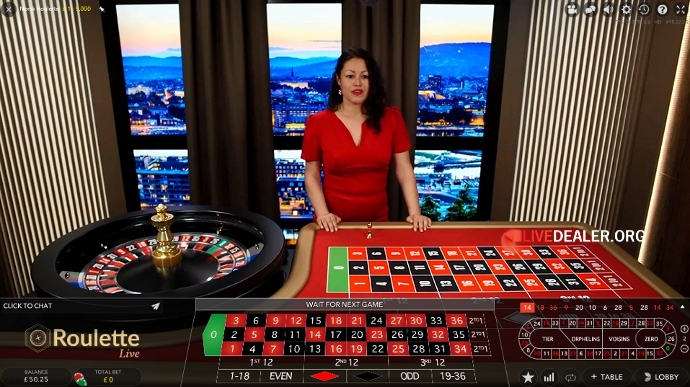 Norsk (or Norwegian if you prefer) live roulette has actually been around in some form for several years at Evolution dating back in the annals to before the Malta studio hatched open early 2014. Although the language for the most part disappeared off the casino radar of most players. 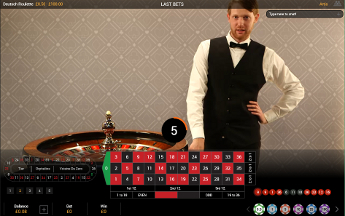 The latest incarnation of roulette and Norwegian speaking dealer is available at several Evolution casinos including Betsafe, Betsson, Unibet, and Leo Vegas. Something would be amiss if it wasn’t also accessible at NordicBet, but it is, so everything makes sense in the Universe sometimes. For the vast majority of players who don’t speak Norwegian or have no plans whatsoever to ever learn the language I’m not advocating you should, but the table is well worth a visit if you fancy a change of scenery or spins are going against you on your normal tables. Which leads onto a wider comment how I appreciate the effort made by Evolution to make the numerous language tables look so distinctive and attractive enough to appeal to players even if don’t speak the lingo. As I’ve stated previously, the Italian tables (especially the Punto Banco) are a particular favourite of mine at Evolution. Compare that approach with Playtech’s Lounge language tables where the most notable visual difference is the presence, or not, of a flag on the table depending if you’re at the Russian or German table. The Playtech tables don’t appeal to me as alternative playing tables, but I suspect the Euro studio is less concerned with table choice and it’s more about only attracting players who speak the lingo. For what it’s worth, if you do speak the lingo and you fancy the lifestyle of a live dealer, head to Malta. 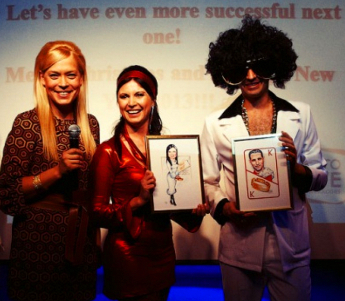 It’s become something of a Mecca for game presenters and dealers with language skills. Evolution, NetEnt and Medialive all having studio tables in Malta. A couple of the lesser known private table areas at Evolution have more blackjack tables open. The Classic set of blackjack tables belonging to Evoke Gaming brands (including Redbet) have increased considerably in number to 11. 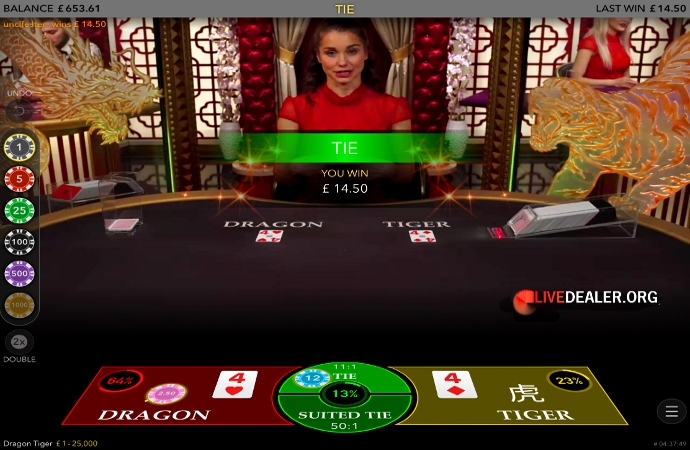 They are also on the way to becoming a lot more well known now that players at Mr Green casino can access the tables following the acquisition deal of Evoke Gaming that was announced at the end of last year. And Virgin Games‘ modest table area routinely now has 4 blackjack tables open. Still unknown by many players I imagine and still on my shortlist of favourite looking, no fuss, no frills private tables.